RALEIGH -- Jessica Rotenberg is the mother of two boys, one who's almost four years old and one that's two and half. She says people often mistakenly ask her if she's pregnant when she's not. Rather than be embarrassed about her postpartum body, Jessica said she decided to think about weight in a different way and share her experience to inspire others to think positively about themselves. "I really enjoyed being pregnant," Rotenberg said. "It was the first time in my life where my stomach was just firm and beautiful, and there was a baby in it, and everybody loved seeing this beautiful pregnant belly, and I felt really good about myself - but as soon as you have the baby, you have this new body that you've never had before." "At this point right now, I'm probably at the highest weight I've ever been because I haven't really lost a lot of that baby weight, so to speak, and the hardest thing for me right now is just kind of adjusting to dressing to a different size, a different shaped body, not necessarily upset by it," she continued. And while Jessica said she's comfortable with her post-baby body now, it's the awkward moments when others have asked her if she's pregnant, that have really stuck to her mind. That sort of thing has happened more times than I can count, honestly," Rotenberg said. 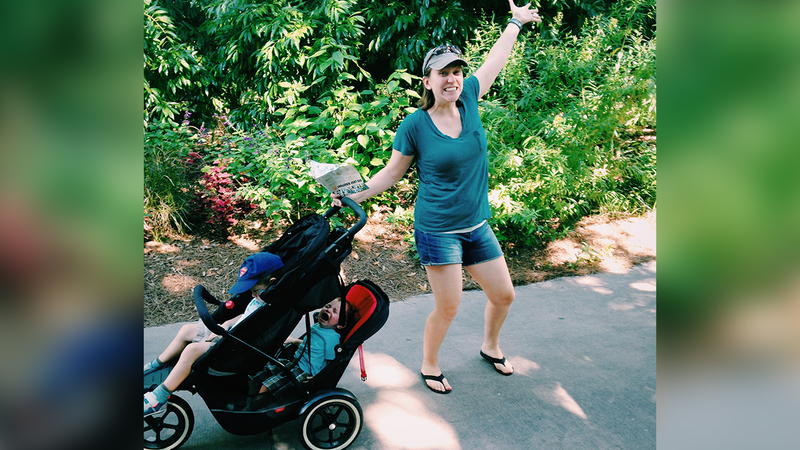 "I've been sporting this postpartum body for some time now and people often mistake me for being pregnant with a third child and congratulate me and it's always something that's felt really awkward and it never felt kind of ok to be angry at people." "My friends would say 'You've got to show them how you feel so they never do it again,' and be really mean and that never felt appropriate to me. Mostly, I just felt bad because people usually were mortified and I felt awful for having said something, even though they probably should know better," she said. Rotenberg said she didn't want to be confrontational because she didn't think people had bad intentions when they asked whether or not she pregnant, so she wrote about her story online, and it's been liked and shared on Facebook thousands of times. "I didn't feel it would be right to be mean about it," she said. "But more often than not the people around me felt that that was sort of the way to go - which is to say something that would stop people in their tracks, and make it really clear that they were in the wrong, and make them feel uncomfortable, and all of that- and I just never felt that that was right for me." "But it still left me going 'well, what is the appropriate response?'" Rotenberg is a family photographer and a stay-at-home mom, and said she wrote the piece after one of the family members in a family she was photographing said "Congrats. When are you due?" "After the man said that and apologized, somebody else in the family also apologized kind of on his behalf because they too were kind of embarrassed that it happened to me and I understood that completely," she said. "But it got me thinking why other people were so mortified that this had happened, why other people felt so bad, and wanted to sort of comfort me, I suppose - and it really meant that we all have to buy into the idea that to be fat is this terrible, awful thing that nobody wants to be." "It really does seem to be the worst thing that somebody could be told and that's sort of when it hit me, like it's just not. Even if you are someone who is very critical of your own weight, that you desperately want to lose weight, I think even those people understand on some level that fat is not the worst thing you could be." Watch Jessica explaining her thought process after mistakenly being asked if she was pregnant. Rotenberg said that when it comes to all the things she thinks are important, fat isn't anywhere close to the top of her list and it's something she thinks other new moms should think about too. "Really consider where you rank weight on the scale of things you want to be versus things you don't want to be. Your goals in life, consider how much time you're giving to that versus other things," she said. "Obviously, it is important to be healthy and spend time caring for yourself, but I think caring for yourself is really different than trying to change the way you look so that you're happy." "For me, teaching my children to be kind, and happy, and being kind to those around us, and contributing in some way to the world - like all those are really important to us and not being mean and rude, and inconsiderate of other people," she continued, sharing her own family's values. "We don't want to be those things. But fat? Like give me a break, fat just doesn't rank very high for me and I think if people reflect upon that, they'll notice the same for themselves." "I think that unless you can accept your body the way that it looks now, losing weight or being smaller, or prettier or whatever really isn't going to change much unless you can accept your body the way it is," Rotenberg said. Check out some Jessica's family photos below.